Mr. Tariq Bajwa was appointed as the Governor SBP by the President of Pakistan on July 7, 2017 for a period of 3 years from the day he assumes the office of the Governor. He assumed his responsibilities on July 7, 2017. A career civil servant by profession, Mr. Bajwa joined the Civil Service of Pakistan in 1981. 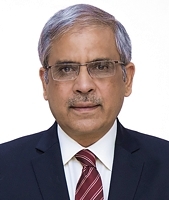 He has varied experience in his career including field assignments of Assistant Commissioner and Deputy Commissioner, Secretariat positions both in the Federal and Provincial Secretariat, General Manager PIA (1992-1996), Head of Pakistan's Trade Mission in Los Angeles (1999-2004), Director General Planning and Finance in Earthquake Reconstruction & Rehabilitation Authority (ERRA) and the United Nations Development Programme (UNDP). Mr. Bajwa served as Secretary Finance, Punjab from 2010 to 2013 and during his tenure he steered the stabilization of the provincial finances, and introduced several reforms including pension reforms. He also contributed as a Director on the Board of Bank of Punjab (2010-2013) during which period the Bank underwent major performance turnaround. In 2013 he was appointed Chairman, FBR (July 2013 to October, 2015) and under his leadership FBR revenues witnessed significant growth, and the concept of Filer/Non-Filer was introduced. The exercise of withdrawal of Statutory Regulatory Orders was undertaken and slabs of Custom Duties were reduced to four. Thereafter, he took charge as Secretary, Economic Affairs Division and then as Secretary Finance from where he retired on June 18, 2017. As Secretary Finance, he also served as a Director on the SBP Board during February - June, 2017. He holds a Master's degree in Public Administration from Kennedy School of Government, Harvard University - where he was awarded the prestigious Littauer Fellowship - and an LLB from the University of the Punjab, Lahore. He attended National Management Course at National School of Public Policy Lahore in 2009 as well as training at National Institute of Public Administration (NIPA) in 2004. His professional expertise and experience includes public policy formulation and implementation with specialization in public finance and taxation.